Are you ready to catch the big one? 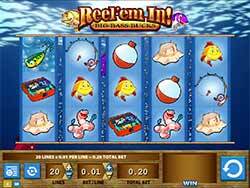 Then put away your rod and reel and get ready for a fishing adventure of a different sort in the 20-line Reel 'em In slot machine (Big Bass Bucks!) from WMS Gaming! Are you ready to catch the big one? Then put away your rod and reel and get ready for a fishing adventure of a different sort in the 20-line Reel ’em In slot machine (Big Bass Bucks!) from WMS Gaming! Fishing is a favorite past time, bringing families together and providing entertainment on tv with shows like Canadian Sportfishing hosted by Henry and Italo. That’s why if you haven’t played Reel ’em In slot online yet, we know that one spin of the reels and you’ll be hooked! Reel ’em In is certainly one fine catch of a game, offering fun bonus features like the Fishing Contest Lure, Big Bass Hole Lure and the Big Bass and a top jackpot prize of 250,000. Symbols on the slot reels include a Pink Wild fish, a blue fish, a yellow fish, a tackle box, a fishing rod, a bobber, a tilly hat, a hooked worm and a scattered lure. Wild Pink Fish – The Pink Fish on the reels is the wild. We sort of think it’s a wild pink salmon but we digress 🙂 The wild fish symbol will substitute for all symbols except Lure, Big Bass Hole Lure, Fishing Content Lure and Big Bass, to complete winning combinations when possible. Scattered Lures – The Lure is the scatter symbol in this game and getting three or more anywhere on the reels with one on the fifth will activate one of three Bonus Rounds including the Fishing Contest, Big Bass Hole Feature and the Big Bass Bonuses. If you manage to get the Big Bass Hole feature, you can win up to 40x your bet per fish you catch! All bonus rounds are of the Pick Me sort and do not offer free spins. The rewards are so great though, we don’t even miss them!